Heroes: Greil’s Devoted Banner & Paralogue Now Available! Four new Special Heroes are ready to charm their way into the hearts of Fire Emblem Heroes players! Spend some orbs on the Greil’s Devoted Banner for special Valentine’s Day versions of Greil, Mist, Ike, and Soren. Check out our earlier article for their preview trailer and a skill breakdown. You can also see all four of these heroes in action in the Greil’s Devoted Paralogue. 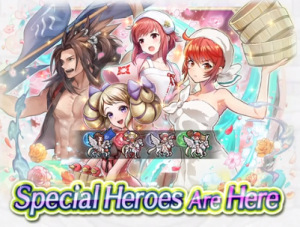 They appear alongside an additional Valentine-themed Titania, who will also be available as an upcoming Tempest Trials unit. The story is a a sweet one, with Ike and Mist able to reunite with their father once again. In addition to the banner and paralogue, we also get a new Log-In Bonus and Lunatic Quests. 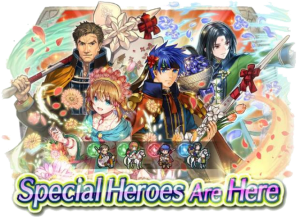 Furthermore, if you’d like a few more Orbs to summon for these heroes, the February Orb Promo is available now as well. For the usual price, you can get 21 Orbs and 60 Sacred Coins. The Greil’s Devoted banner and quests will be available for one month, ending on 8 March. Best of luck adding some devoted heroes to your team! Additionally, the Heroes 2nd Anniversary is still going strong. Today’s free banner is based on Ephraim & Myrrh’s BHB and contains 5★ focus units for Anamnesis Eirika, Ephraim, and Myrrh. Today is also the final day for the Find and Vote Heroes mini-game, so make sure you’re submitting your votes! 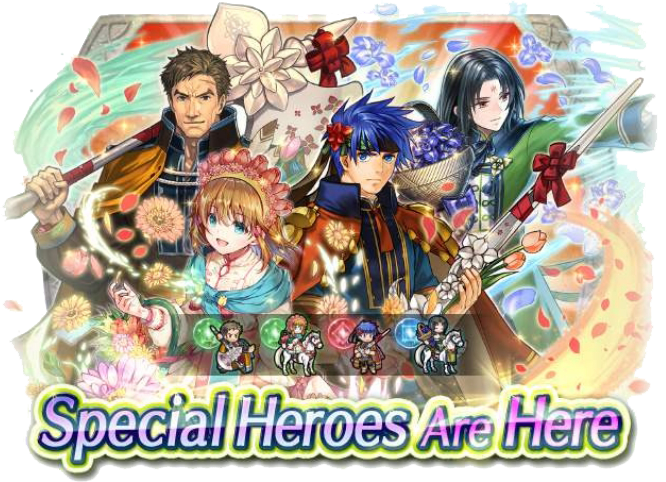 Heroes: Hostile Springs Banner & Paralogue Now Available! 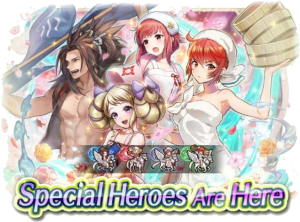 Four new Special Heroes are splashing their way into Fire Emblem Heroes! 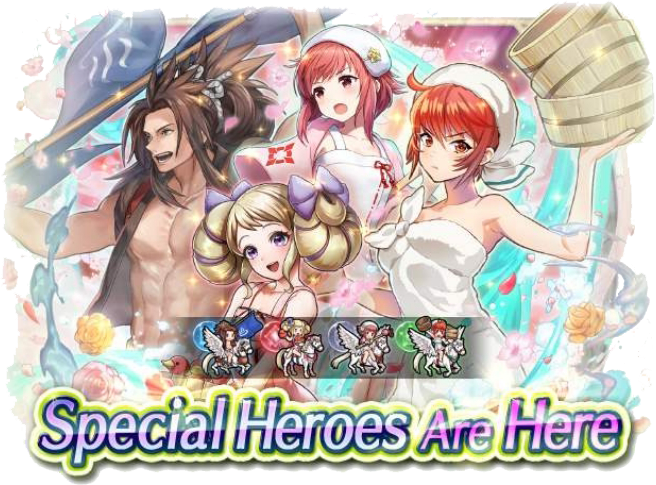 Try your luck on the Hostile Springs Banner for new hot springs versions of Ryoma, Elise, Sakura, and Hinoka. Check out our earlier article for a look at their skills and trailer. A new paralogue chapter, also titled “Hostile Springs“, also begins today! Complete all three chapters and their associated Lunatic quests for an additional 12 Orbs. We also get a new Log-In Bonus starting today for even more Orbs! The Hostile Springs Banner will be available for a whole month, ending on 23 February. Good luck adding some new heroes to your team! However, keep in mind that we’ll also have a new Mythic Hero banner next week and more Special Heroes on 7 February. If you caught the teaser pic from the other day, you’ll have probably had a hunch about an incoming hotsprings banner. Fans of the heat and squeaky-clean special summons can rejoice, as we’re about to receive just that, in the Hostile Springs Special Heroes Banner. We do have a handful of new skills in this flier-centric series, aside from the neat variety of weapons, including Air Orders 3, Atk Feint 3 and Spd Opening 3. Included in the maps, Summoners can spot a flying Colorless dagger Camilla (someone arguably expected by fans, to appear in a Fates-based banner such as this). Camilla: Steamy Secrets will be a reward unit that can be earned in the next Tempest Trials+ event. Hostile Springs brings with it, a paralogue miniseries (great for collecting Orbs), and the banner will be active from January 23 – February 22, (Midnight – 11:59 pm PT). 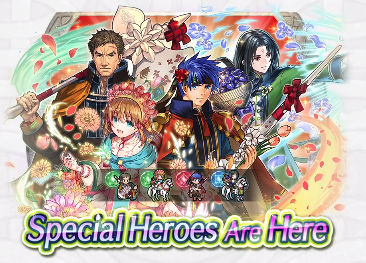 If you’re interested in going for this batch, best of luck, and remember, there’s another Special Heroes banner coming out in a couple of weeks, so there’s a lot to consider for the month of February! For more details on the Heroes, click Read More. For the English Trailer, click here. For the Japanese Trailer, click here.